Salzburg is famous for Medieval and Baroque buildings. This is why most international tourists come and what they expect - and they will not be disappointed. 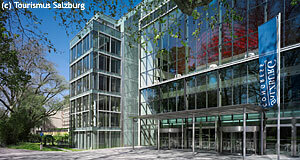 However, as an important economic centre, Salzburg also offers a great deal of interesting modern buildings. In this small section, we have presented a few of them and hope to meet the interest of a some of our readers who want to go beyond the city's historic centre.